and can not leave this earth yet to go to heaven in peace. a group of persons who died in an accident or in unnatural circumstances, for example in a fire or at sea. A Misaki curse for seven people. There are also groups of seven cursed people who will develop a high fever and die. 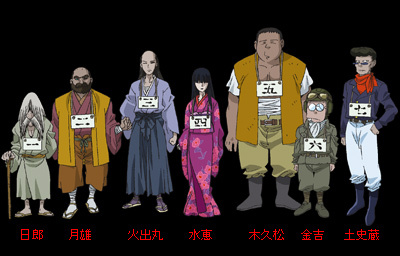 They are a kind of 集団亡霊 group of dead spirits, group of dead souls, unable to go to heaven. The Shichinin misaki (七人ミサキ or 七人みさき), which means "7-person misaki," are a group of ghosts first known in Kochi Prefecture, told about in the Shikoku and Chūgoku regions. They are dead souls 死霊 shiryō of humans who die from calamities and accidents, especially drowning at sea. As according to its name, they normally, together as a group of 7, appear mainly near water, like seas and rivers. Humans who encounter the shichinin misaki experience a high fever, and die. By possessing and killing one person, one of the spirits of the shichinin misaki are able to go to peace, and in its place, the one who was possessed and killed becomes one of the shichinin misaki. For this reason, the shichinin misaki are always a group of seven, never increasing nor decreasing. There are several accompanying legends about the progenitor of this spirit, but among the most well-known is the ballad of the vengeful spirit of the Sengoku military commander of Tosa Province (now Kochi Prefecture), 吉良親実 Kira Chikazane, told about in classics like the "Rooho Kidan" (老圃奇談) and the "Shin'i Kaii Kidan" (神威怪異奇談). 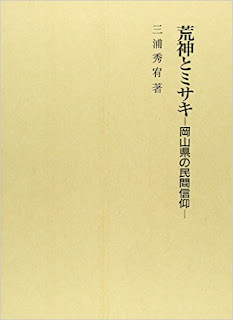 During the Azuchi–Momoyama period, after the death of the 長宗我部元親 Chōsokabe Nobuchika, the eldest son of Kira Chikazane's uncle Chōsokabe Motochika, since he opposed Motochika in supporting Chōsokabe Morichika as the successor, he was ordered to commit seppuku. 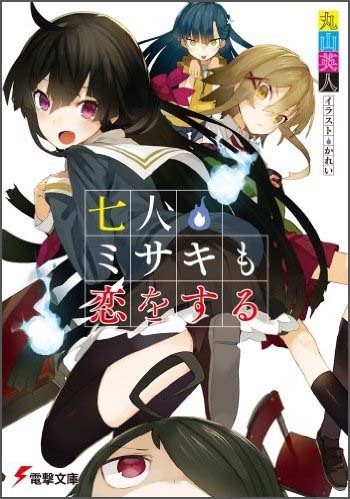 At that time, several vassals also followed suicide (and thus 7 people in total), but afterwards, various strange events started happening at their graves, and the vengeful spirits of Chikazane and the rest were feared as the shichinin misaki. 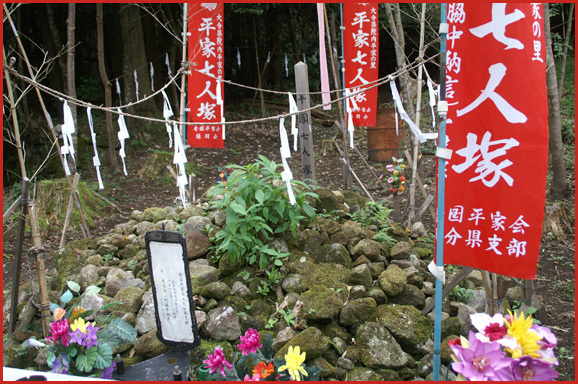 Motochika, who heard of this, held a memorial for them, but there was no effect, and in order to pacify the vengeful spirits, Kizuka Myojin (木塚明神) was deified at the gravesite of 西分村 Nishibun Village, 益井 Masui (now Kōchi). This is the currently existing Kira Shrine. Also, according to the "Doyooiken Kidan" (土陽陰見奇談) and the 神威怪異奇談 "Shin'i Kaii Kidan," 比江山親興 Hieyama Chikaoki, who also opposed Motochika along with Chikazane, was also made to commit seppuku, and all 6 of his wife and children were also given the death penalty, and it is said that the total of 7 people became the 比江村七人ミサキ Hie Village shichinin misaki. Also, in 広島県三原市 Mihara, Hiroshima Prefecture, there was a mound called "Kyoozuka" (経塚, "sutra mound" or 狂塚, "insanity mound"), where there were once 7 brutal mountain priests, and when the people they tormented worked together to kill them, their vengeful spirits became the shichinin misaki, and it is said that this mound was made in order to pacify that curse. 7 female pilgrims who were thrown into the ocean, the soldiers who lost their lives in Tenshō 16 (1588) from the Chōsokabe Motochika inheritance controversy, the spies of 伊予宇都宮氏 Iyo Utsunomiya who died in the Eiroku period, and so on.
. Chōsokabe Motochika 長宗我部元親 Motochika and the Chosokabe clan . it is said that it is possible to flee from the shichinin misaki by going about while hiding one's thumb in one's hand. People built a Hall for 地蔵 Jizo Bosatsu and recite the sutras to appease their souls. is an urban legend told about in the later half of the 1990s. In the Shibuya area in Tokyo, seven female high school students met death one after another. It is said it is because these students who performed compensated dating got pregnant and aborted their children, and the children's vengeful spirits became the shichinin misaki (or, the vengeful spirits of the children resurrected the shichinin misaki of the above legend), and were taking their revenge on their mothers, who were the female high school students. There are various mounds named Shichininzuka 七人塚, or 七人落ち Shichinin ochi. The deity here 狩人の神 is venerated by the hunters. Once seven hunters went deep into the mountains after their dog and never came back. Other mounds were erected for seven Samurai who lost in a battle, some for seven priests. Mostly seven people who drowned or were killed together. If they drown on a certain day, there will often be another accident in the next month, prolonging the curse. Once upon a time, the whole family of seven of the village elder was killed and then strange things begun to happen. A priest advised to use a boulder in the river as a Misaki stone for their souls. Now every year during the O-Bon rituals for the ancestors, people come here to perform ritual dances and say 念仏 Nenbutsu prayers. If they forget to do that one year, there will surely be a curse. At the hamlet of 節崎 Fussaki there is a large 用水池 irrigation pond with, where Shichinin Misaki have a sanctuary. Every year a person drownes in this pond, so that one of the souls can go to heaven. This is a place where the bones of people, probably samurai were found burried. Children who nearly drowned in this pond tell about a woman at the other side, trying to invite them to come over. Seven people are venerated at the Misaki in 一本松村小山 Ipponmatsu Koyama. They are seven people who have been killed by a young Lord with the figure of a serpent, or so they say. Near the beach of 大浜 Ohama there is an evil Misaki, which often invites living people. If someone dies there, a great dragon might be seen. Sometimes a body of someone who drowned is washed ashore here. Anyway, there are now seven people dead. The Shichinin Misaki come out in the evening and lure people who walk here, to get near the cliffs and drown. Sometimes if a dog barks, the person comes to his senses and is saved. The same legend is told in 東温市 Toon town 西岡 Nishioka.
. Gongen Deities of Japan 権現 - Introduction .
. takagari 鷹狩り hunting ground of the Lords . Once a fishing boat with seven people on board was in great danger during a storm. But it was to difficult for the other fishermen to get out and help them, so all seven died. 30 years later a young fisherman of just 18 years died at sea. And after him one more and one more. 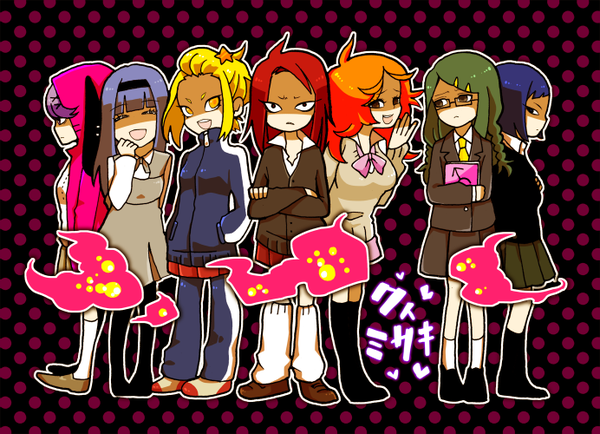 This was the curse of the Seven Misaki. This is the local word for 七人ミサキ Shichinin Misaki, especially for seven people who died in the war or at sea. おたちきさん（大太刀君） Otachiki san "Master of the Big Sword". Later when villagers passed by this spot, they heard seven invisible people talking and then built a sanctuary in their honor. During a severe drought (旱魃 / 干ばつ), the farmers begun fighting for water and seven of them got killed, bringing a curse to the village. When a fishing boat hits the watch tower at the rock of the cape, there will be a bad catch. The same holds for 亀島のエビス岩 the Ebisu Rock at 亀島 Kamejima Island . If this happens at the Eastern end of Tsurushima and cape 伊勢ヶ鼻 of 弓削島 Yugeshima Island, then people will get a stomach ache. Near the river people get a high fever for unknown reasons, said to be haunted by Seven Misaki. 神様のユキアタリ cursed by the deity. The Seven Misaki bring sudden chills, fever or other illness. ガンドー gandoo, numanetsu 沼熱 /ヌマネツ fever or ショーキ shooki. If a fishing boat is bewitched by the Seven Misaki, it will not be able to move any more and seven crew members will die.
. 道祖神 Dosojin, 道六神. 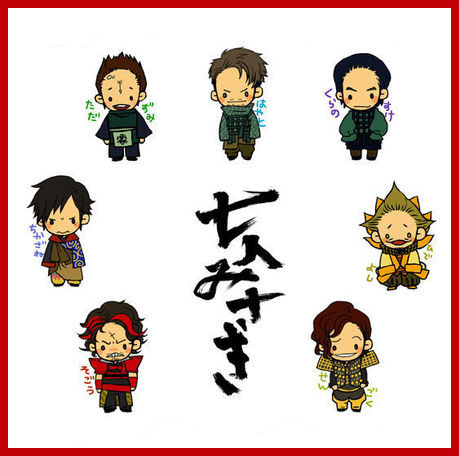 道陸神 Doroku-Jin, the Wayside Deities . They are usually protector deities, but can turn malignant. If someone has died in a river or mountain forest, people come together for the funeral and eat a meal together 産火（サンビ） sanbi "fire of life" and 死火（シニビ）shinibi "fire of death". Some get a sudden fever from it or a severe stomach ache. They never call it "Seven people Misaki", but simply みさき Misaki. On August 16, the day after the O-Bon rituals, the seven often come to roam the rivers, rice fields and sweet potatoe fields. Often they also come after strong rain. Some Misaki are for children who die during the rainy season. sannin misaki 三人みさき / サンニンミサキ three Misaki people. Once seven young woodsmen went to the mountains and stayed over night in a hut. While they were making jokes in the evening, one got killed by a hatchet by accident. So the others commited Harakiri, cut their stomachs and died too. Now they are appeased with a special Mound. Sometimes people get a sudden chill for no reason and feel their presence. The legend of seven Shikoku Henro pilgrims turning into Misaki is also told here. At the hamlet 尾浦集落 Oura three used to be some miko ミコ shrine maiden, who performed oracles and divination. They also used to perform rituals for the Seven Misaki. Once an old woman suffered from severe pain in the shoulder. From an oracle she learned that her grandfather was one of the "Seven Misaki", which could not find peace in heaven. He had first tried to bewitch his own son, but he did not pay attention to it. So Grandfather begun to bewitch the woman, his granddaughter. Another old woman got ill and collapsed in the toilet, her illness got worse and worse. From an oracle she learned that this was a curse of the Seven Misaki. So she prepared seven dumplings and burned incense in a ritual to appease their souls. Her seven ancestors had perished at sea and cursed the world. So now she had to perform regular rituals to get her health back and diminish the curse. When the eldest son of 長宗我部元親 Chōsokabe Nobuchika was killed in the war against the Shimazu clan 島津征伐, his second and third son begun to fight for the right to the family head (which was usually the eldest son). The second son and seven of his followers got killed. These seven could not go to heaven and became a storm, later to be venerated as Seven Misaki. Sometimes a strange ball of fire was seen on the horizon above the sea, sometimes a sound like an earthquake was heard from the mountain. Anyone who experienced this got ill and had to undergo exorcism rituals. Sometimes the spirit healer had to drink seven cups of tea to make the Seven Misaki souls go away. At a dangerous place called Takiyama six people had died. The villagers called a diviner and learned that this was a curse of the Seven Misaki. So they built a small temple for Jizo Bosatsu and prayed there carefully every year to prevent them from killing another person. Other areas are especially haunted in Summer. People built small five-story stone pagodas to appease the wandering ghosts. This healing is also performed at 香南市 Konan town, 香美市 Kami town and 南国市 Nankoku town. One reason for the Seven Misaki in the Tosa region is said to be the Shikoku Henro pilgrims, seven women of them died here. They sometimes come back as balls of fire at the bottom of a cliff and curse the village. People come in contact with the Seven Misaki while on boats, near rivers, mountain roads, crossroads or along the coast, on days of bad weather in summer. They can not see them but feel the heat. If they hit one straight on, they will have to die, to make one of the seven go to heaven and take his place with the cursed souls to keep the number of SEVEN. The curse of their souls haunts the region. Priests or special healers perform exorcism rituals when this seems to turn into an epidemy. In the area of 宇須々木 Usuki, the legend of Seven Misaki dates back to the Eiroku period (1558 - 1570). Spies tried to enter the land of Lord 土佐一條 (土佐一条) Tosa Ichijo and were killed. These seven spies from 大州宇都宮 Utsunomiya are appeased here. If someone gets ill suddenly, they he kazefuke カゼフケ "met the bad wind", the Seven Misaki, the local ガンドー gandoo. He has to stand at the entrance of the home, facing outside and the family members fan him with a 箕 winnow to make the illness go away. misaki doo ミサキ堂 Hall for the Seven Misaki. There is a road crossing 越知町 in the town of Ochi where people often get a sudden chill and die. They are haunted by the Seven Misaki.
. shichinin Misaki 七人塚 mound for seven people - 上越市 Joetsu . Okayama prefecture has a lot of legends about Misaki. At the hamlet 大石 Oishi the Seven Misaki are venerated. Once a bewitched grandfather had suddenly complained of being cold on the hottest day of summer. He got his heating table (kotatsu 炬燵) and warm blankets to hide and then when all had gone he hang himself. Then more suicides of hanging begun to happen in the hamlet and the local priest had to perform exorcism to appease the souls of the dead and stop the suicides. tooboo トウビョウ Tobyo "The bewitching Snake"
The トウビョウ Tobyo snakes come down the Southern slope to the village maybe once every 30 years and bewitches seven people, who become crazy and die. There is no medicine or exorcism ritual to help these people. 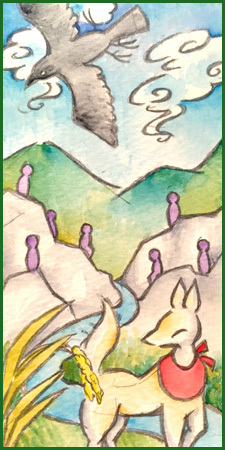 jinushi sama 地主様 "The Deity of the Land"
the villagers killed seven travelers and got cursed by them instead. So they build a sanctuary and perform rituals to appease their souls. Once seven hunters went into the mountain forest to hunt but never came back. So the villagers built a mount for them ミサキ塚. Even now sometimes in the mountain forest the call of a rooster can be heared. Anyone who hears this will be dead within three days. Therefore people are afraid to go deep into the mountain.
. goryoo, onryoo 御霊、怨霊 vengeful spirit . - In the Heian period (AD 794–1185) Goryo were generally considered to be spirits of nobility who had died as a result of political intrigue and who, because of their ill will for the living, brought about natural disasters, diseases, and wars.
. hokora, hokura, shi 祠 （叢祠　神庫） small Shrine .